The Tax Cuts and Jobs Act (“TCJA”) signed into law on December 22, 2017 brought a number of notable changes to the income taxation of trusts and estates. Most of these changes are effective for tax years 2018 through 2025 and are set to revert to pre-TCJA status in 2026. 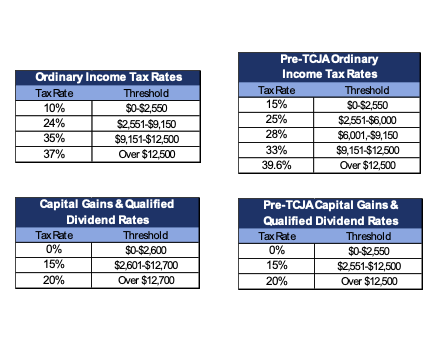 The law provides a new schedule for ordinary income tax rates and new thresholds for capital gains and qualified dividend rates, as shown below with pre-TCJA rates adjacent. These tax rates would only apply to estates and irrevocable trusts, as revocable trusts are taxed as pass through entities with income flowing through to the trust grantor, the owner of the trust assets for tax purposes. Because the taxable income of an estate or trust is calculated in the same manner as for an individual, many of the amendments to the Code as it applies to individuals are relevant changes applicable to the taxation of income of trusts and estates. Individuals, trusts, and estates have the option of taking the flat, no-questions-asked standard deduction to reduce taxable income or to deduct the total of certain expenses allowed by the Internal Revenue Service known as itemized deductions. Before the TCJA, individuals, trusts, and estates could take the full amount of their state and local real property taxes, state and local personal property taxes, and state and local income taxes as an itemized deduction against federal taxable income. The TCJA added §164(b)(6) to the Internal Revenue Code, imposing a limit on the deduction. Unless a trust or estate incurs the real or personal property taxes in operating a trade or business, it will now be limited to a maximum deduction of $10,000, in the aggregate, for the aforementioned state and local taxes. An additional change to the itemized deductions allowable under the code relates to what are known as miscellaneous itemized deductions. Miscellaneous itemized deductions are a category of itemized deductions subject to a limitation of 2% of adjusted gross income. Trusts and estates, like individuals, are no longer able to take any miscellaneous itemized deductions under § 67. Any investment fees and expenses and unreimbursed business expenses previously itemized will no longer be deductible. However, the law does not seem to impact the deduction for administration expenses incurred solely because property is held in a trust or estate. Further clarification will be required on this point. Prior to the enactment of the TCJA, in addition to taking either a standard deduction or itemizing deductions, individuals, trusts, and estates were entitled to deduct a specific amount of money, known as the personal exemption, for themselves and, in the case of individuals, for each of their dependents. Although personal exemptions for individuals have been suspended under the amendment to § 151, trusts and estates will continue to be able to make use of their personal exemptions under § 642(b). The personal exemption amounts for trusts and estates remain the same. If a trust operates a business, the new excess business loss limitation under § 461(l) becomes relevant. Amended § 461 limits business losses in excess of business income in any tax year to $250,000 (adjusted for inflation in years after 2018). This loss limitation is applied in the aggregate at the trust or estate level if the trust or estate is a partner or shareholder in a partnership or S corporation, respectively. Any loss in excess of $250,000 will be added to the trust or estate’s net-operating-loss carryover to be used in a future tax year. For a trust or estate that generally uses business losses to offset portfolio income, this may have tremendous impact. Miscellaneous itemized deductions include expenses such as tax advice fees, casualty and theft losses from property used in performing services as an employee, fees to collect interest and dividends, and credit or debit card convenience fees, among others.